Very funky and bang on trend, this reminds me of Winter Skiing trips. 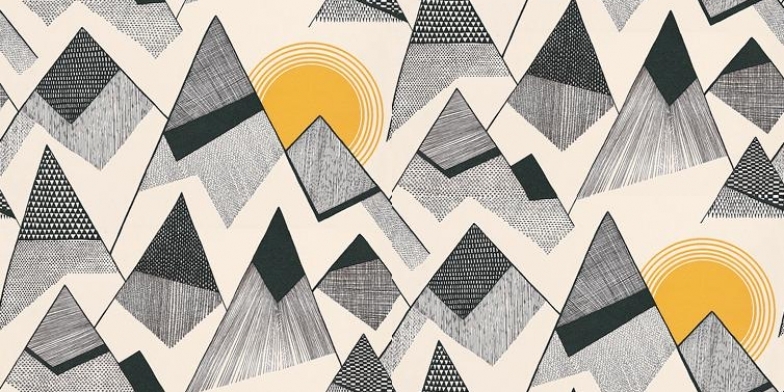 MissPrint Mountains comes in various colourways but I’ve showcased this one with its glorious yellow sunshine and mountains in a variety of grey shades. Use it as a feature wallpaper and tone with acidic yellows and greens. Use flashes of colours in your cushions, rugs, accessories and soft furnishing. If you’re feeling really bold, get yourself a colourful sofa in green perhaps and really go for it. Available at Wallpaperdirect for £59.95 per roll. Great job. These are wonderful ideas. One can just visit this blog to admire your work. Thank you.